Why Is Jesus' Sinless Life Important? | Purpose of the Incarnation | Why the Title "Son of Man"? The word "incarnation" is derived from the Latin incarnor meaning "to be made flesh". God came to the world in the flesh. Jesus Christ, the Son of God, is God incarnate  deity clothed in humanity. How could the Son of God  the Alpha and Omega, the first and the last, eternally-existent with the Father  also be human, a descendent of Adam? He created Adam! So, how could He possibly be Adam's descendent? Saying that Jesus became a human does not mean that God turned Himself into a human, or that He ceased to be God when He became human. God the Son was still God. As the Son of Man, He took on a new nature, a human nature, uniting it with the divine nature in one Being and Person: Jesus Christ, true God and true man. We call this the "Incarnation". The importance of the virgin birth isn't just about fulfilling messianic prophecy. It shows us that salvation ultimately comes from the Lord, that it unites the full deity and full humanity into the Person of Christ, and that Christ did not inherit sin. The Bible teaches that all people have what's called "original sin". This terms is used to describe the effect of Adam's sin on his descendants. And it is because of this sin nature that all humans are under the sentence of death. Why No Sin Nature in Jesus? As shown above, we inherit a sinful nature from Adam. 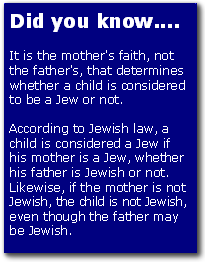 It originated with Adam and is passed down from parent to child. So, if we inherit our sinful nature from our parents, then Jesus, who had Mary as a parent, must have had a sin nature. Right? Not necessarily. The Bible supports the idea that the sin nature is passed down through the father, not the mother. The Bible says that sin entered the world through Adam, not Eve. Eve, who was deceived, was the one who sinned first. However, sin did not enter the world through her; it entered through Adam (see Romans 5:12 above). In the Old Testament, God repeated several times that it is the iniquity [wickedness, evil] of the father that God will use to exact punishment on future generations. As you can see, the Bible clearly supports the idea that the sin nature is passed down through the father, not through the mother. However, contrary to the false teaching of the Roman Catholic Church, this does not mean that Mary was free from inherited sin. Like all of us, she also inherited the sinful nature from her father. But since Jesus did not have a human father, He did not inherit the sin nature which is passed on by the father. Although He was fully human, he was without original sin. Jesus had two natures: God and man. "For in him the whole fullness of deity dwells bodily." (Colossians 2:9) Jesus received His human nature from his human mother, but He retained His divine nature through the work of God the Holy Spirit. Therefore, Jesus is both God and man. He was sinless, had no original sin, and was both fully God and fully man. Jesus laid aside His perfect, undefiled eternality and took on a human body with all of its weaknesses and limitations. He experienced hunger, fatigue, pain, sorrow, joy, disappointments, frustrations, and heartbreak. The Creator of the universe voluntarily stripped Himself of His power and became a helpless baby. The Source of all wisdom and knowledge went to school and learned to read, write and study God's Word. "And Jesus increased in wisdom and in stature and in favor with God and man." (Luke 2:52) He went through a learning process just as all other children did in His time. He callused His hands and scuffed His knuckles working as a carpenter. Jesus demonstrated that He was sinless in His life, through His words, and His actions; and this truth was also affirmed by other people, such as Pilate. "Pilate said . . . 'I find no guilt in him.'" (John 18:38) When Jesus asked the Jews who opposed Him, "Which of you convicts me of sin?" in John 8:46, he received no answer. Was Jesus Capable of Sin? Could Jesus have sinned? Did He have a choice like we do? This is a very emotionally-charged point of discussion and disagreement among God's people. Some say that God cannot be tempted by evil (cf. James 1:13), and since Jesus is God in the flesh, then He could not sin. That begs the question, that if He could not sin, then how can we say He was tempted in all points as we are? How could Satan's temptations in the wilderness be real temptations? Some people believe Jesus had to have a sinful nature in order for Him to be tempted. Not only does this flawed theology contradict Scripture, as we've previously shown, but it is not a logical assumption. Adam did not have a sinful nature and yet he was tempted and fell. Jesus did not have a sinful nature [because He didn't have a human father]. He was tempted and He did not fall. So, Jesus not having a sin nature does not mean He could not be tempted. No doubt, some who read this will disagree with our conclusion. And if you can show us Scriptural evidence for your point of view, by all means, please contact us. But we are not here to discuss opinions or certain churches' traditions. We must seek at all times to align ourselves with God's Word, even if it feels uncomfortable or goes against our traditions. God's Word is the standard against which all truth is measured. We have established that Jesus Christ and God the Father are eternally co-existent. Even though He was born into a human body, Jesus did not inherit the sin nature, which means He was fully God while also being fully human. God hates wickedness (cf. Psalm 45:7). ...then it is reasonable and Scriptural to conclude that Jesus, as God in the flesh, could not sin. If Jesus' human nature existed by itself, apart from the divine nature, then like us, His normal human nature would have been capable of sin. But, Jesus' human nature was not separate from His divine nature, which is morally pure and incapable of sin. Thus, we can say that Jesus was able to be tempted in His human nature, but not in His divine nature. In the one Person of Christ, there dwells two natures: God and man (cf. Colossians 2:9). Scripture does not clarify for us exactly how these two natures relate to each other in one Person. However, as you can see, it is possible for Jesus to be divine and be tempted at the same time because He was both God and man. In order to be tempted, Jesus had to be human. Yet, since there is nothing in God that has even the remotest tendency to do wrong, then there can be nothing presented from without to induce Jesus, in His divine nature, to do wrong. Why Is Jesus' Sinless Life Important to Us? We have all been taught and have believed that Jesus' sinless life is important to us and necessary for our salvation. But why is it so important? The Old Testament priest was the person who represented the people to God. He sacrificed animals for their sins and prayed for them. Therefore, it would be helpful, even essential, that our priest be able to identify and sympathize with whatever we're going through. The Bible teaches in Hebrews 4:15 that Jesus was tempted like we are, that He knows what we are going through, and that He understands our weaknesses. He experienced first-hand the same problems we experience and some that most of us will probably never experience. This is why the writer of Hebrews tells us we can "approach the throne of grace with confidence..." (Hebrews 4:16 NIV) because we have a compassionate and understanding High Priest. In order to represent us and bring us to God, Christ had to suffer as the just for the unjust. Although He was innocent, He suffered and died as our spotless sacrifice so we could go free, even though we were guilty. To do this for us, He had to be sinless ["without spot or blemish"]. No sinful person could ever pay the price for anyone else's sin. Jesus Christ could suffer in our place only if He committed no sins for which He would have deserved to be punished. Christ saves us, not by living a sinless life in our place [the false doctrine of imputation], but by suffering the punishment of sin for us. His life is not substituted for our life; rather, His death was substituted for our punishment and death. The sinless life of Jesus was essential to our salvation because it was necessary to qualify Him as the sacrifice for our sins. give us His righteousness [right standing with God] and all the blessings promised to those who keep God's laws. Satan tried to make Jesus sin and turn Him aside from His mission. But Jesus rejected all temptation and carried out His mission to save us. Jesus' goodness was not just negative [the absence of evil], it was a positive commitment to God's perfect will. He not only refused to do wrong, He was dedicated to doing right. He was love incarnate. Think of it! Jesus loved us so perfectly that He didn't know how to hate another human being! Sure, He hated sin and hypocrisy and anything that would replace God in our lives and our hearts, but He loved the sinner. He was known as a "friend of sinners". Yet, He never sinned. Instead of His association with sinners changing Him, He changed sinners! Jesus lived as a man in order to show us, on a level that we could comprehend, exactly what God is like. We can see the character of God demonstrated in Him. By knowing Jesus we can know God. The Son of God became a man to show us what perfect manhood can be. We see in Jesus' perfect life and character the pattern, the potential, and God's plan for mankind. He is our example. He is the standard by which our words, thoughts, and actions are measured. He shows us the kind of life we can have when He lives in us and makes us sons of God. Jesus' life established His qualifications for His mission. His sinlessness showed that He was worthy to be our Substitute. His power, wisdom, and love prove that He is qualified to be our King. Jesus' life as a man was necessary preparation for His mission. His experience gave Him an understanding of human nature that prepared Him to be our Representative and our Judge. Jesus had to become a man in order to be our Priest. He has shared our weakness. He understands our problems. He learned the cost of obedience through His own suffering. Jesus prayed for His followers while He was on earth. And now  with a deep familiarity and personal identity with our need  He prays for us in heaven. Jesus' experience as a man prepared Him to rule over men. The Son of Man  the perfect Representative of Adam's race  will one day be our Sovereign Ruler. He will be a perfect King because He knows just what we need. He understands us. And because He died for us, He has the right to govern our lives. Now He is King in the lives of those who accept Him. Some day He will rule the world for which He died. Jesus was born so He could die. The whole human race had sinned and was condemned to die eternally  every single one of us, no exceptions, from the best of us [e.g., the Pope, Mother Teresa, Billy Graham, the virgin Mary, or anyone you can name] to the worst of us [e.g., Joseph Stalin, Adolph Hitler, Saddam Hussein, Osama bin Laden, or anyone else you can name]. The only way to save us was for God Himself to take our punishment. But as God, He could not die. So He became a man to die in our place and save us from our sins. Jesus did more than take our place on the cross, though. He rose from the dead and offers to all who accept Him a place in His eternal kingdom. He unites us with Himself so we can share all His rights as His brothers and sisters. In Bible times a mediator was appointed by the court to represent a bankrupt person and take charge of all his affairs. The mediator was responsible to see that all the creditors were paid in full. If what the bankrupt person owned was not enough to pay his debts, the mediator himself paid them. What a beautiful picture of Jesus! He is our Mediator before God. His death covers all our debt of sin, and in Him we are free from the sin and guilt that separated us from God! Jesus became a man in order to bring God and man together. Sin had opened an impassable chasm [a deep gap] between a holy God and corrupt, rebellious man. But God's love found a way to bridge the gap and bring man back to Himself. Jesus came to be the Mediator of a new covenant or agreement between God and man. The tree on which Jesus died bridges that gap. He gives us a new nature  His nature  and makes us true children of God. By taking our human nature, Jesus reaches us and lifts us to a better world. The Son of God became the Son of Man so we could become the sons and daughters of God! Why the Title "Son of Man"? The command to keep the Sabbath was given to the nation of Israel by God Himself. He sternly commanded: "Six days shall work be done, but the seventh day is a Sabbath of solemn rest, holy to the LORD. Whoever does any work on the Sabbath day shall be put to death." (Exodus 31:15) And yet, when the Pharisees accused Jesus' disciples of breaking the Sabbath, Jesus declared: "For the Son of Man is lord of the Sabbath." (Matthew 12:8) A bold statement, indeed, for one who is only human!